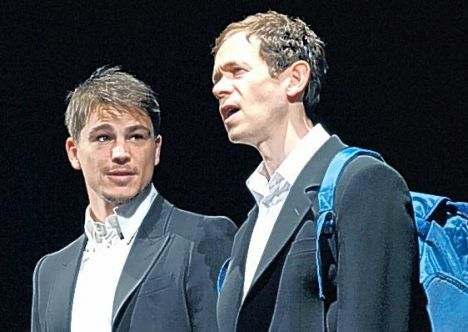 LONDON – In a reversal of the usual path of play to movie, the hit West End production of “Rain Man,” with an adaptation by Dan Gordon, has Hollywood star Josh Hartnett in the film’s Tom Cruise role and British stage veteran Adam Godley in the title role for which Dustin Hoffman won an Oscar. They are both very good as Hartnett matches Cruise for charisma and the harried selfishness that typifies salesman Charlie, younger brother of the institutionalised autistic Raymond. Godley inhabits “Rain Man” with his own ideas of how to play the part and the two men do a convincing job to portray both the things that separate them and those that bring them together. Unable to duplicate the elements of a road picture in the theater, writer Gordon stages key scenes in a series of dull motel rooms where the austere furnishings allow the siblings’ unlikely but colorful relationship to flourish. Director Terry Johnson knows how to make the best use of two characters within four walls, and the interplay between Charlie and Raymond is entertainingly realized as the younger brother’s initial feeling of resentment gives way to understanding and sympathy. Tall and snapping with energy, Hartnett succeeds in making Charlie’s transition from seeking only to exploit the situation to one of trying to make it work. Godley takes a different path from Hoffman’s movie performance, playing Raymond with a high-pitched rush of words that gradually give way to the kind of calm that results from a feeling of safety. It’s a strong and touching performance. The time frame has been updated to a post-9/11 world so that the things Raymond can recall in amazing detail have a modern sensibility and the things he’s scared of include being on a United Airlines flight. Less sentimental than the film, the stage “Rain Man” manages to simplify the obstacles and crosscurrents that affect the two brothers while not minimizing their dramatic impact. It would be surprising if other enterprising actors did not want to take on the roles that Gordon has adapted so cleverly so this is a play that should travel well. Venue: Apollo Theatre, London, runs through Dec. 20; Cast: Josh Hartnett, Adam Godley, Tilly Blackwood, Charles Daish, Colin Stinton, Mary Stockley; Playwright: Dan Gordon, based on the MGM motion picture, story by Barry Morrow; Director: Terry Johnson; Set Designer: Jonathan Fensom; Lighting Designer: Jason Taylor; Sound Designer: Fergus O’Hare; Music: Colin Towns; Presented by Nica Burns, Jane Walmsley, Michael Braham, Max Weitzenhoffer. This entry was posted in Reviews, Theatre and tagged 'Rain Man', Adam Godley, Apollo Theatre, Dan Gordon, Josh Hartnett, Terry Johnson. Bookmark the permalink.